If you complain that there isn't much difference between two candidates of different parties, don't blame the parties. A reading of the party platforms will give you a much better view of the differences between democrats and republicans. I did a little review of the GOP take on immigration reform and found the following excerpts. Take note at how differently the delegates view the problem, compared to Bush and McCain. Elitism isn't just for democrats; republican candidates also think they know better than the unwashed masses. Our country’s ethnic diversity within a shared national culture is unique in all the world. We benefit from our differences, but we must also strengthen the ties that bind us to one another. Foremost among those is the flag. Its deliberate desecration is not "free speech" but an assault against both our proud history and our greatest hopes. We therefore support a constitutional amendment that will restore to the people, through their elected representatives, their right to safeguard Old Glory. Another sign of our unity is the role of English as our common language. It has enabled people from every corner of the world to come together to build this nation. For newcomers, it has always been the fastest route to the mainstream of American life. English empowers. That is why fluency in English must be the goal of bilingual education programs. We support the recognition of English as the nation’s common language. At the same time, mastery of other languages is important for America’s competitiveness in the world market. We advocate foreign language training in our schools and the fostering of respect for other languages and cultures throughout our society. We have reaped enormous human capital in the genius and talent and industry of those who have escaped nations captive to totalitarianism. Our country still attracts the best and brightest to invent here, create wealth here, improve the quality of life here. As a nation of immigrants, we welcome all new Americans who have entered lawfully and are prepared to follow our laws and provide for themselves and their families. In their search for a better life, they strengthen our economy, enrich our culture, and defend the nation in war and in peace. To ensure fairness for those wishing to reside in this country, and to meet the manpower needs of our expanding economy, a total overhaul of the immigration system is sorely needed. The administration’s lax enforcement of our borders has led to tragic exploitation of smuggled immigrants, and untold suffering, at the hands of law-breakers. We call for harsh penalties against smugglers and those who provide fake documents. We oppose the creation of any national ID card. · Restore credibility to enforcement by devoting more resources both to border control and to internal operations. · Reorganize family unification preferences to give priority to spouses and children, rather than extended family members. · Emphasize needed skills in determining eligibility for admission. · Overhaul the failed Labor Certification Program to end the huge delays in matching qualified workers with urgent work. · Reform the Immigration and Naturalization Service by splitting its functions into two agencies, one focusing on enforcement and one exclusively devoted to service. The education reforms we propose elsewhere in this platform will, over time, greatly increase the number of highly qualified workers in all sectors of the American economy. To meet immediate needs, however, we support increasing the number of H-1B visas to ensure high-tech workers in specialized positions, provided such workers do not pose a national security risk; and we will expand the H-2A program for the temporary agricultural workers so important to the nation’s farms. Now, let's take a look at this growing problem and why the delegates felt a need to address it. 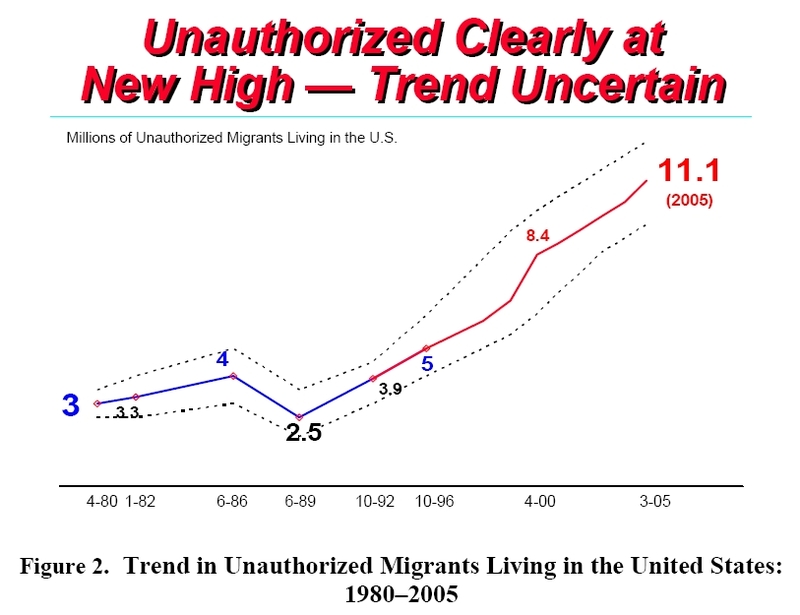 Below are two charts from Pew Hispanic Center that show the growth of the illegal alien problem from 1980 to 2005. 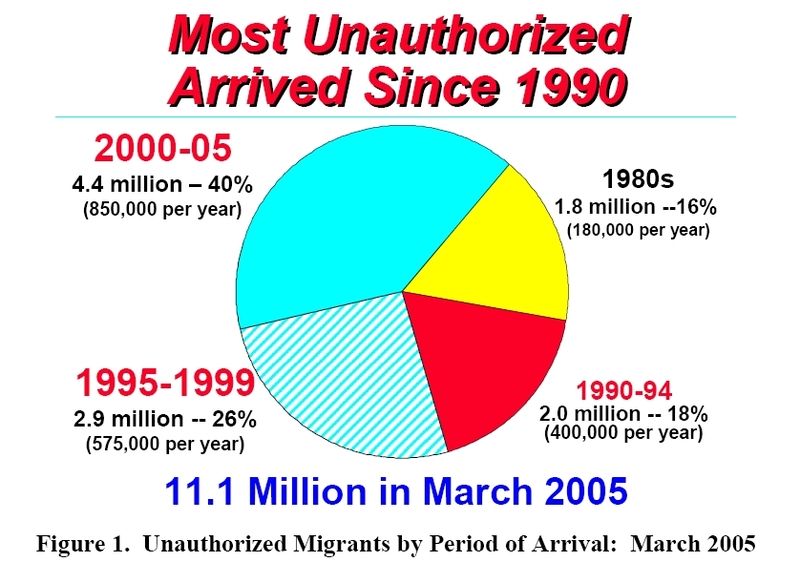 In the 1980s, we were seeing about 180,000 illegal aliens entering per year. By the 2000s, the number had climbed to 850,000 per year! Now, let's look at what candidate George W. Bush was saying at the time. A week before the 9/11 attacks, Bush had Mexican President Vicente Fox at the White House. The visit came after six months of high level meetings between our State Department and theirs, hammering out what they called a "safe, orderly, legal and dignified, and agreed on the framework" for immigration reform. As the report of their meeting attests, "Both [Bush and Fox] stressed their commitment to continue our discussions, instructing the high-level working group to reach mutually satisfactory results on border safety, a temporary worker program and the status of undocumented Mexicans in the United States." 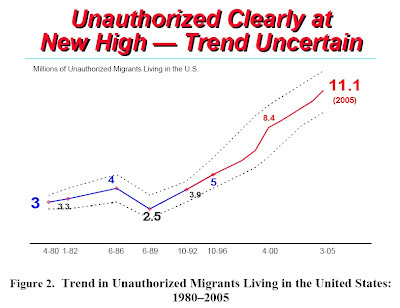 Obviously there was more detail to "the status of undocumented Mexicans" than Bush was willing to talk about. Clearly he was negotiating with Mexico, but it wasn't in our best interest. Now, Bush obviously ignored the GOP platform of 2000 when he courted Vicente Fox and put amnesty over security. So, how did the party respond in their 2004 platform? Did we embrace the Bush legalization or not? advantage to those who have broken our laws. welcoming immigrants who enter America through legal avenues. It's hard to figure that one out. It almost seems the GWB people inserted a guest worker amnesty juxtaposed hard against a "no amnesty" statement. Strange. Perhaps the platform writers understood the difference. Whatever the intent, the illegal alien problem would continue to grow. By some estimates ONE MILLION illegal aliens were entering per year from 2004 to 2007; a situation that would only be abated by a recession in the United States, making jobs more scarce. If we wanted leaders who would lead by the tenets of the platform, we never got it. Not in Bush; not in John McCain. And thus we find conservatives looking for candidates they can trust.